Malware infection is very panic situation. Although updated antivirus is capable enough to detect known threats. But few malware can escape the antivirus protect and case mode damage. It becomes worse if the malware disable your task manager or modify registry information. 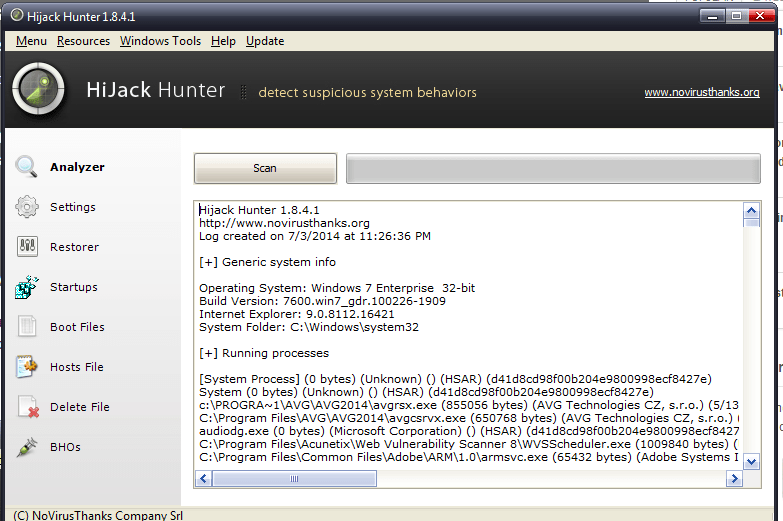 To solve these kind of malware related issues, you should have Hijack Hunter. This is a nice software utility which can detect the hidden malware in your system and offers solutions to the damage these malware did in your system. It is a free tool and available for free on Sourceforge. 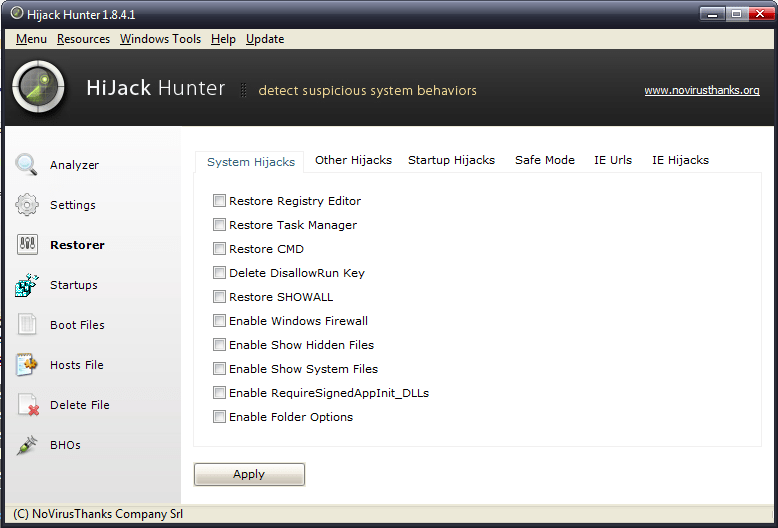 Download Hijack Hunter and install in your computer. Portable version of the tool is also available. So, if you don’t want to install, you can download the portable version. Now run the Scan. It will take few minutes and scan the various areas of your system. In my case, it took around 10 minutes. And after the scan, it created a log file automatically. You can see the above screenshot to know what system areas it scanned to generate the log file. Log file opened automatically when scan finishes. I don’t think you may fine it easy to understand the log file. Because it is too complicated and contains technical information. You can also find the same log in the tool. At the left side, you will find other tools. In the settings section, you will find various configuration settings on the tool. You can also check Startups, Boot files and Host Files. You can also use this file to delete files which you can not delete normally. Don’t be surprise if you never faced this. Sometimes if a file is in use by a program, you cannot delete it. So, this tool can be helpful in deleting those files. This software is fully compatible with 32 bit and 64 bit Windows Operating systems. It works on all available version of Windows. 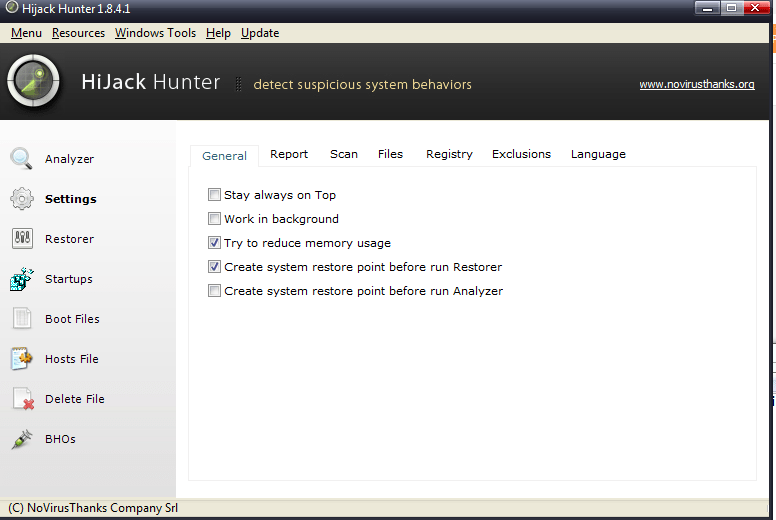 Hijack Hunter is a powerful tool to audit your Windows based system. I personally like the Restorer section of the tool. After the malware attack, you can use this section to restore your system back to the normal.